Now, this is tricky. 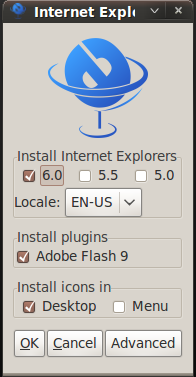 When you have a number of powerful alternatives for Microsoft Internet Explorer in Ubuntu Linux, why do you need IE in Ubuntu anyway. Firefox 3.5 is already the most used web browser in the world. The thing is, most of those who want IE installed in their linux laptops/pc's are either web developers and the rest are those who just got stuck in an 'IE only website'. There is a easy hack though. Lets take a look. First of all you need to get the latest version of wine. Do the following depending on the version of Ubuntu. Open Terminal and copy-paste the following line into Terminal(Give password when prompted). For Ubuntu versions before Ubuntu 9.10, this is little bit trickier. First you have to get the gpg key and later you to add the wine ppa repo to your sources.list. Don't worry, let me make it simple for you. Copy-paste the following line to Terminal to add the gpg key. Now, add PPA Repo depending on the version of Ubuntu you use. For that, simply copy paste the command into Terminal. Now, install the latest version of wine in ubuntu. Done. Cabextract is a dependency you need to install. Now, unzip the downloaded tar.gz file. (Right click > Extract here). Open the extracted folder and double click 'ies4linux' file. Choose the 'Run' OR 'Run in Terminal' option. Following window will pop up. Choose the options you want and that is it.